Gift shopping is one of the best parts of the holiday season. Nothing quite compares to hand selecting a present that expresses your love, appreciation, and gratitude for those closest to you and witnessing their surprise when they open it. A spa gift card is one gift that everyone on your shopping list is sure to love, and Radiance Day Spa in Sioux Falls is your go-to source for all your holiday gifts this season. Check out three reasons why your loved ones really want to receive a spa gift card for the holidays and order yours online today! We all have that one person on our shopping list who rarely makes time for themselves. Maybe it is your friend who is a stay-at-home mom, or maybe it is your hard-working brother. All too often, people don’t take the time to treat themselves to a little self-care, either because money is tight, or they just don’t make themselves a priority. There is no better gift than self-care, and by giving your loved ones a spa gift card, you provide them with the opportunity to get some well-deserved TLC that they wouldn’t otherwise treat themselves to. We have all been on the receiving end of a gift that we know we will never use. Your mother-in-law may have bought you a particularly unflattering sweater, or your boyfriend missed the mark when he bought you a new bottle of perfume. One of the best things about a spa gift card is that your recipient isn’t forced to receive a service that they don’t like. Rather, they can choose the service that best suits their individual needs and preferences, allowing them to get the most out of your gift. Aside from being able to pamper themselves with any spa service they want, another reason your loved ones want a spa gift card is that they can choose when they want to receive their services. Booking a spa service for friends and family members is a very thoughtful gift, but it doesn’t allow your recipient to book their service on their own time. A spa gift card can be tucked away for a rainy day or it can be saved for a time when your recipient is especially stressed and exhausted. Everyone loves the gift of luxurious spa treatments. Whether you are shopping for your friends, family members, or anyone else, a spa gift card is ideal because it provides your recipient with the opportunity to choose their favorite spa treatment and pamper themselves whenever they feel the time is right. Plus, once they experience the benefits that come with our professional spa services, they’ll be all the more appreciative of your thoughtfulness. Are you ready to simplify your holiday shopping experience? 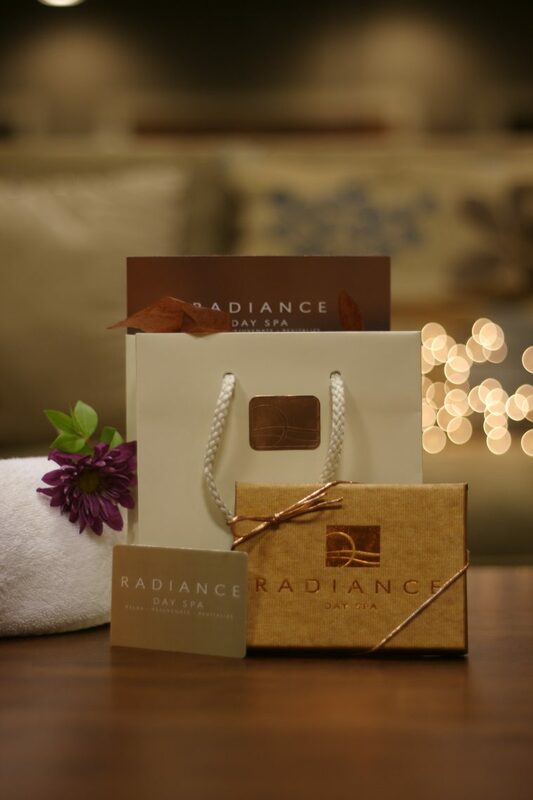 Buy spa gift cards from Radiance Day Spa today to give the gift of relaxation, rejuvenation, and revitalization!